We plan to make our streamed seminars available also as mp3 files. We are experimenting with this process right now and hopefully we will also be able to offer an RSS stream later (to make it possible to subscribe to HUMlab seminars). In today’s seminar Linda Bergkvist talked about her experiences of the Sims as a gamer. Linda is a very active online artist and community person. She is not a game researcher which I found rather refreshing in this context. She is a gamer gamer and she was not afraid to talk about potentially non-pc aspects of playing the Sims (killing charachters in various ways, breeding beautiful people etc. etc.). I learnt a great deal about the game itself. One important aspect of the game, of course, is its function as participatory media. Linda talked quite a lot about communities, various mods (modification to the basic software), sims design and people using her art in their Sims houses. Among other things, we discussed the underlying structure of the Sims (the model) in some detail and we also talked about what is accepted and not (where do you/the community draw the line). Before leaving I talked to Stefan and Alf from the Ethnology department about basic structures that are not easily changeable in a game like this one: for instance the role of the home, spatial stability, and, after all, family. We are fortunate enough to have Mikael from UCIT (Umeå Center for Interaction Technology) cover many HUMlab activities for the UCIT web. Here are some articles on/related to the symposium on language education and information technology that we ran last week. The articles are in Swedish. Mobilt lÃƒ¤rande sprÃƒ¤nger klassrummets grÃƒ¤nser (Mobile learning opens up the classroom) In a few hours we will continue thinking and hearing about The Sims. 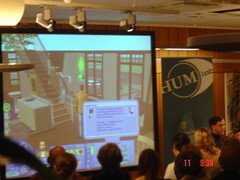 Linda Bergkvist will talk about her life in The Sims (2) in a HUMlab seminar at 10.15 CET. After a few extremely intense and exciting days filled with conversations, presentations, discussions and demos, HUMlab now suddenly feels very calm. The few students that resist the temptation of spending the Friday afternoon in the beautiful sunny weather are working at their computers, and most of the HUMlabbers are either conversing about the experiences from the symposium or taking some time off in the sun to make up for lots of hard work. One of the things that I believe helped turn this event into something valuable for most participants was the diverse subjects of the presentations at the symposium. Presentation topics ranged from entertainment and education in the SIMS via communicative language learning in Traveler, intercultural challenges in European projects and the use of corpora in language education, to a discussion on what language technologists can do for language teachers. Our international guests, Ravi Purushotma and Agnes Kukulska-Hulme, both touched upon similar issues indicating what might be the upcoming trend in the field. Some of the points they had in common concern the emergent use of everyday technology, augmented reality for language learning and ways of making the most of spare time â€“ for instance, being able to learn languages while on the bus or while rollerblading. Of course, one great benefit of having a national conference like this is to get a better overview of what is happening in the language learning and technology area on a national level. However, I believe it’s been valuable to get some fresh input and some insights into the developments in this area outside of Sweden as well. Some more reflections of mine can be found here. Right now a workshop on mobile learning is taking place in HUMlab – led by Agnes Kukulska-Hulme from the Open University. She is doing a great job (together with the particpants of course) and when I visited a few minutes ago there was lively discussion going on and a mix of people and competences present. They were just about to start group discussions. At the same time, in the inner room in HUMlab people were discussing and presenting the reachin device we have. Today and Tomorrow (US Pacific time) UCHRI organizes an event on “Cloning Cultures: Normatives. Homogeneities, and the Human in Question”. UCHRI stands for UC Humanities Research Institute and they do very interesting work. I visited not too long ago. This conference raises profound questions about the nature of our contemporary society and the social injustices and inequalities compelled by “hidden” normativities; it seeks to make visible the myths of homogeneity and the paradoxes of difference and sameness. There is more global interconnection between people than ever before but, at the same time, strong (intra- and international) resistance against diversity. Choice for more of the same products goes together with ever faster cycles of technological innovation. What are our possible futures in the era of the limitless scientific engineering? Looking at the program there are many really interesting talks. Donna Haraway on “We Have Never Been Human: Comanion Species in Naturecultures”. Derek A. Burrill on “More Human Than Human: The Cloning of Avatars in Videogames”. Troy Duster on “Increasing the Gaps: From Wealth and Technology – to Health and Molecular Biology”. To mention a few. Fortunately it seems that there will be a live webcast. Excellent! Today is the first day of the symposium, Från vision till praktik, in the lab. We have about 90 people set around the lab (quite impressive) and are using multiple screens and video cameras so everyone can see and participate. After opening comments by Dean Lars-Erik Edlund, Patrik and Ulrike Klingemann about the importance of the student’s perspective during the next two days, Ravi Purushotma began his very interesting presentation, Changing Language education through popular media: learner rights, computer games and German songs. In his own research, he is using the SIMS as an immersive environment for the beginning German language learner. Some of his points: Entertainment and Learning/materials do not have to be mutually exclusive. It is interesting that we always start from the text, and then add media. Why not start from the point of engaging media? Ravi stressed changing the way curriculum is formed. Get away from text only based language learning. It is ineffective way of sharing culture and does not create an engaging, authentic learning environment. He stated that we need teachers and curriculum designers who can really understand popular culture, can manipulate and embed popular media in the curriculum, as well as make these materials easily shared. When is a good time to install a new projector? Answer: The day before a major event. There were some technical problems but the technical crew sorted them out. Us having so many screens, sources etc. and a complex control system make operations like this one relatively complex. A more difficult task, however, was to configure the lab for 80 people/seats (and another 10-15 HUMlab people). Today was a rather hectic day in the lab with lots of things going on at the same time. We had a most interesting coffee break in the morning with some music band people (some of them Polish – see photo here), Stephanie’s Polish apple pie, Stephanie doing recordings for a podcast, Ravi who told us about playing books on his mobile phone at speeds between 150%-200%, lots of other people and two workmen drilling holes in a concrete wall to fasten a display case for some of Linda‘s art books. After the coffee Therese asked me about educational blogs (they are doing a workshop on blogging and language learning for our upcoming symposium) and I said that I thought that the computing science or informatics department had set one up recently. Short afterwards this guy approaches us and says that he overheard us talking and that he and his classmates have used a blog for their computing science course. He also told us about another example. This is an example of the meetings that are really vital to a place like HUMlab.